Do I Need a New Heater This Season? Part of the reason that people like boilers so much is because they tend to be more resilient than their counterparts. Boilers have fewer moving parts than furnaces and heat pumps, and are therefore less prone to develop issues. Just because a boiler is tougher than other systems, though, doesn’t mean that it is completely immune to problems of any kind. Boilers can still run into issues, which is why you need to be on the lookout for signs of a problem if you’re using a boiler this heating season. 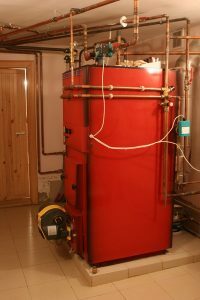 The following are just a few of the symptoms that can indicate a problem with your boiler. A boiler that is bubbling like an oversized teakettle is not a healthy boiler. This tends to happen when water gets trapped in the heat exchanger of the system for too long, typically due to limescale or some other sediment buildup restricting the flow. Believe it or not, most boilers aren’t supposed to actually boil water. So, when the water in the heat exchanger boils into steam it puts a tremendous amount of pressure on the system that it wasn’t meant to handle. This causes the rumbling sound. In previous decades, kettling could cause the heat exchanger to actually rupture from the strain. That usually meant replacing the entire system. Now, though, most boilers have fail-safes that disable them until the problem is fixed. Leaks are never a good thing for hydronic systems. If you’re lucky, the leak is located in the boiler itself and you only have to worry about water damage to the system. Maybe a little to the surrounding floor. If you’re unlucky, a leak springs in one of the pipes running through the floor of one of your rooms and you end up with a significant amount of water damage. If you notice an unusual drop in heat in one area of the house, or actually spot a leak on the boiler itself, you should definitely have it fixed as soon as you can. A drop in heat in one area of the house usually means a leak or blockage. A drop in heat across the entire house could mean something a bit different. A boiler that isn’t heating as well as it should be might be having issues with its pump. The water gets heated, but the system just can’t circulate it properly. It’s also possible that the opposite is true. If the boiler is having trouble actually heating the water, it might be due to a buildup of carbon particles on the burner assembly. Assuming, of course, that you’re using a gas boiler. Carbon buildup can prevent the burner jets from all firing like they’re supposed to, and that results in less heat being directed at the water in the heat exchanger. Professional cleaning should resolve this issue without much fuss. PRK Services, Inc. offers a full range of boiler repair services in Denton, TX. If you need any help with your boiler, contact us today to schedule an appointment with one of our professional technicians. We’ll make sure that your boiler stays healthy this season.